Remote radio crane controls (a.k.a. wireless pendants) for hoists and overhead cranes are quickly becoming the norm in our industry and with good reason. The cost of these devices are very reasonable and the reliability of this technology has increased over the years. By removing the operator from the area of the lift safety is increased and accidents are reduced – a win-win situation for the business and the operator. A remote crane control system consists of a portable transmitter unit (the remote) that generates control signals, plus receiving equipment (the receiver) permanently installed on the crane and electrically connected to the crane’s motor controls. The control can have a wide array of load handling options as well as the capability to control multiple hoists at the same time. The transmitters are built to last in harsh environments and are composed of industrial strength materials for years of service in the harshest of environments. Most are powered by two AA batteries and use very little energy, and only when in operation, ensuring a long battery life for predictable operations. Visibility and mobility of the operator go hand and hand for increased safety. With a wireless pendant, an operator is able to move with and around the load – removing themselves from any possible danger from load handling. Being able to move, and to move the load, allows the operator to get into a position to see different angles of the lift for better efficiency in load handling. Also, the operator can be out of the way of the lift – greatly increasing the safety of the lift. Some people have expressed concerns about overlapping radio signals or hacking of the radio remote system. In terms of overlapping signals, each controller generates a unique combination of pulses that are transmitted to the receiver preventing interference of signals. At the crane, the pulses are removed from the carrier signal and activate the desired motor controllers (response time for the electronics is practically instant). The receiver has circuitry for decoding the signal sent from specific handsets and converting them into suitable signals for the crane’s motor controllers. Only the correct signal will be received by a control unit AND only a recognizable pulse code format will be decoded, preventing the accidental operation from other nearby units. The circuits in the units and in the hoist controls are shielded against the effects of interference or unintentional code signals so these controls are quite secure from outside interference. 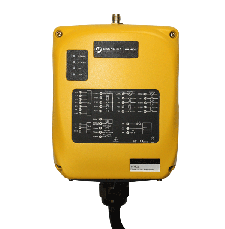 A typical installation requires one radio frequency channel per transmitter, and one access code per crane. As for physical security, we suggest storing the transmitter or pendant in a secure location at the work site. This prevents anyone from “accidentally” using the crane. Operating staff will have to actively look for the control device, a step that may keep untrained personnel from “trying it out” and causing accidents or damage to product and equipment. Keeping the transmitter with the required crane inspection log book also encourages the operator’s to perform daily inspections. Remote control of the crane also allows for the operator to be the person who does the hooking and attaching of the load. With fixed position controls, two people may need to be involved, or one person goes back and forth between the load and the controls. With a remote portable pendant, the operator can be involved in the load lifting as well as the load handling. An example of that can be seen in this case study. At the other end of the crane control system is the receiver. Most receivers come pre-wired with a length of cable and mounting hardware allowing for fast installation. 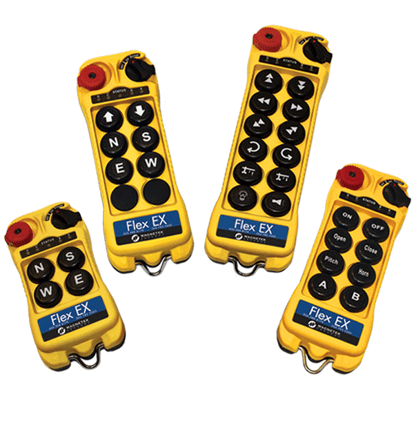 Systems like the FlexEx from Magnetek come with onboard diagnostic and output LEDs to provide system status information with the added benefit of easily accessible components that are replaceable. Most receivers are fully enclosed to provide protection in the harshest indoor or outdoor environments preventing dust, mist or water from entering the receiver. A three-position selector switch allows one operator to switch operation between two trolley/hoists (A, B, or Both) that are located on a single bridge. The operator can easily identify which trolley hoist is active on the crane by the position of the selector switch. This system allows two operators to control two bridge cranes or trolley/hoists independently or simultaneously with the three position selector switch. One operator can maximize the capabilities and lift power of two bridge cranes or both users can operate each bridge crane independently. The system allows one operator to select multiple receiver units at one time, so one operator can control up to 2 bridges and 4 trolley/hoists simultaneously or independently. This simplifies installation by eliminating the control festooning running from bridge to bridge. In most cases, remote crane control systems for cranes can be added onto existing crane setups by our technicians. Of course, we’d have to confirm that by inspecting your existing system to ensure compatibility with the pendants we carry but in almost all cases we have been able to retrofit existing equipment to a remote system. Need to know more? Contact an Acculift representative right now to discuss how radio remote control pendants can fit into your operation.